Our team collaborated with FCW staff, Vygieskraal residents, and members of other ECD organisations to develop several outcomes over the course of this project. These outcomes include new relationships formed between the WPI team, FCW staff, and Vygieskraal residents, suggestions and resources for the two outreach models, a document summarising input we received from other ECD organisations about the two proposed outreach models for ECD, and a formal proposal which was submitted to FCW discussing the two outreach models for ECD. Over the course of this project, our team created strong bonds with FCW staff and Vygieskraal residents. FCW gave us the freedom to explore and expand upon two ECD outreach models, invited us to put the WPI logo on the ECD resource hub, and expressed interest in hosting another WPI project team in the years to come. From the day that we arrived in Cape Town, they welcomed us into their family, bringing us along to a company conference and including us in various celebrations. It was through FCW that our team was able to connect with the residents of Vygieskraal. At first, the people of Vygieskraal with whom we worked were hesitant and language differences were an obstacle to communication, but after a couple of weeks we were able to have casual conversations. We also had the opportunity to see their day-to-day lives through a social science research technique called PhotoVoice, asking them to take photographs of the positive aspects of their community, as well as some of the challenges that they see in the place they live, which they later described to us. When they explained the photographs they took, we were able to gain insight into how they view their neighbours and the place they live as a whole. The time we spent in Cape Town helped develop a mutual appreciation between our team, FCW, and Vygieskraal residents. We felt that we learned a great deal from them, and they expressed their gratitude for having learned from us as well. During our time there, our conversations helped develop a strong connection between FCW and the Vygieskraal community. 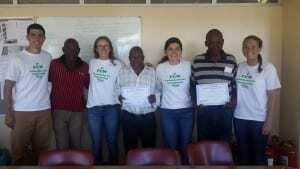 On our last day with Vygieskraal residents, FCW scheduled a future meeting with them in the New Year. On 14 January, 2016, both parties will sit down to discuss how to continue with improvements of ECD outreach efforts in Vygieskraal. This connection will hopefully keep ECD in the forefront of the community mind-set, and will encourage further community development. We are excited to keep in touch with FCW staff about this progress, and are optimistic for the future of Vygieskraal and the impact that the two outreach models we have explored will have on the local area in the future. Many low income communities have existing facilities nearby that often have time and space available for use by outside organisations. FCW set up a trial of the public space model at the Sports and Recreation Stadium across from the Vygieskraal settlement. In conducting this trial, FCW staff made contact with the stadium manager and ward councillor to establish a relationship and work out a schedule and conditions of use. In collaboration with FCW, Vygieskraal residents, and other ECD organisations, we developed several suggestions on how to improve implementation of this model in the future. These suggestions are based on evaluation on the ECD programmes that were held at the Vygieskraal Stadium, but are applicable to a range of ECD related programmes that could be held in an accessible public space. Initiate the FIF Programme in the community before holding childhood development programmes in a group format and establish home visitors from within the settlement. This would help increase awareness of ECD in the settlement and allow Home Visitors to develop relationships with families from the community. Once the model is implemented, home visitors can explain the model to residents of the settlement and spread word about the ECD programmes to the families they work with. This would ensure that parents and caregivers are aware that ECD related services are being held in the public space and that they know of the time and location of the programmes. This encourages a smooth transition from FCW workers providing the ECD services to the Home Visitors becoming the facilitators. Properly market the model to residents. Create flyers in the primary language spoken in the target community that advertises the public space as the location of the programmes. Choose a time to hold the programmes when parents are least busy with other responsibilities. Hold the programme once within the community to generate interest with minimal inconvenience to parents. Provide incentives for coming to the public space, such as snacks and activities like resume writing. Set up a schedule that covers a specific topic to be discussed each day to allow attendees to come whenever they can or to come to hear about topics that are of interest to them. Discuss broad topics such as nutrition, healthy lifestyle, and general health and wellbeing. Hold awareness workshops on topics in addition to ECD, such as preparing children to enter primary school, having proper documentation, and medical records. Identify individuals early on who regularly attend and participate in the model and openly express interest in helping out with ECD in their community. Have these individuals assist the facilitator with the programmes. Ask them to spread the word about the ECD services to other caregivers in the community. Ask them to provide feedback on how they think the model is working, so that the model can be adapted to fit the needs of the community. In the second model, FCW proposed using a shipping container as a hub for ECD resources that can be located in communities that have limited access to ECD related items and can be used to supplement existing ECD programmes. It also has the potential for providing more opportunities to local families and ECD centres by allowing them to check out items for a specified amount of time. 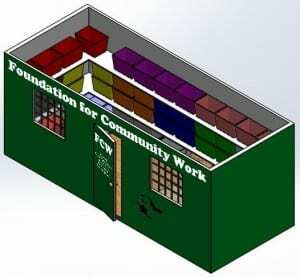 At the beginning of the eight weeks, we had hoped to purchase, refurbish, and fill a shipping container as FCW’s first ECD resource hub. However, as we realised that the process would take longer than expected, we shifted our focus to creating detailed plans for the future. These plans will ensure that the process of acquiring and filling a shipping container to make it into an ECD resource hub is reproducible. They will also help reduce the amount of work FCW staff members need to put into the start-up, saving them time and increasing efficiency. Options for electricity for lighting and an outlet to charge electronic devices. Awning to create shade and a space near the container to facilitate the use of the materials and exposure to ECD. While some refurbishments listed above are more critical than others, it is not required that a shipping container used for the ECD resource hub model has all of them. In our final week, we had a meeting with FCW staff and a shipping container distribution company that ended with the purchase of a container! The ordered refurbishments included a steel door with a security gate, two windows with security bars, two rows of steel shelving over a 6 meter side and a 2 meter side, white interior paint, green exterior paint, and electricity with overhead lighting and two outlets. Advertising the purpose of the hub to the target audience is dependent on the way the container is branded. The goal of the shipping container and the materials within is to provide easy access to ECD tools. Therefore, the graphics on the exterior should reflect the contents inside. FCW has previously worked with a branding company to put their logo on vans, signs, and more. We contacted this company and collaborated with them to arrange a design with FCW’s logo, WPI’s logo, and an open space on the graphic to include the logos of other partnering organisations in the future, if applicable. The goal of this advertisement is to promote the importance of the ECD pillar, to create positive associations between ECD and the organisations sponsoring the project, and to acknowledge the partnerships between the various stakeholders involved. The materials in the ECD resource hub are essential to the success of the model. They represent a large investment in both time and money. Therefore, it was crucial to devise a system that keeps track of the items, along with the condition they are in. Inventory will be completed on a monthly basis and logged on an inventory spreadsheet [pdf, 221kb] that tracks the items in each box, their condition, and the date of the inventory. A sign-out sheet [pdf, 199kb] tracking the movement of the items and their condition as they are borrowed will keep a record of who has borrowed materials and where they were used. By keeping the ECD resource hub organised, stakeholders accessing the materials will have an easier time navigating and taking inventory of supplies within the shipping container. We designed a floorplan detailing the layout of the shipping container to facilitate long-term organisation and more productive ECD learning for the children utilising the model. 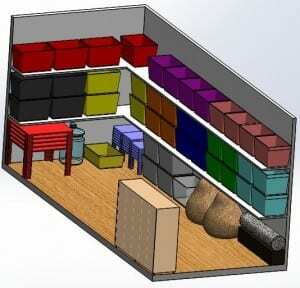 We generated a scale and color-coded, Computer-Aided Design (CAD) model of a 6 meter x 2 meter shipping container filled with various boxes, shelving units, tables, and chairs, among other items. Our team met with several ECD organisations throughout Cape Town to gather feedback on the two proposed outreach models for ECD; one involves utilising a public space (e.g., stadium, school, community hall) for ECD outreach and the other consists of transforming a shipping container into an ECD resource hub. These meetings served a dual purpose as our team was also able to learn about the various approaches to ECD in surrounding areas across the Western Cape. We spoke with Centre for Early Childhood Development (CECD), Early Learning Resource Unit (ELRU), Grassroots, and Sikhula Sonke. From this, we were able to work with FCW to produce a document of the various suggestions made for the ECD models. This document is linked here for download [pdf, 284kb]. In order to obtain support and funding for these two new alternative ECD models, FCW staff requested a proposal that they could distribute to government agencies and potential sponsors. The proposal discussed the two different models for expanding ECD outreach services in under-resourced communities: (1) utilising a public space for ECD programming, and (2) retrofitting a shipping container for use as an ECD resource hub. In the proposal, the models are explained, as are benefits and obstacles of using each model. FCW is using this proposal as an organisational reference tool and in future requests and applications for funds and grants from local organisations and government municipalities.